Hello,thanks for visiting ! I am a mad keen card maker who has made one or two forays into scrapbooking, but I always come back to cards. I am passionate about papers, and all the cards I make revolve around the paper I am using. I also stamp and emboss, but really only to enhance the paper.I share my home with a husband and two young men ( my sons ) who are very patient with me when tea is running late because I have lost track of time when I am creating! I will endevour to bring you lots of new ideas with papers that are readily available. There is nothing worse than seeing a card you like and then finding you can’t source the items used. 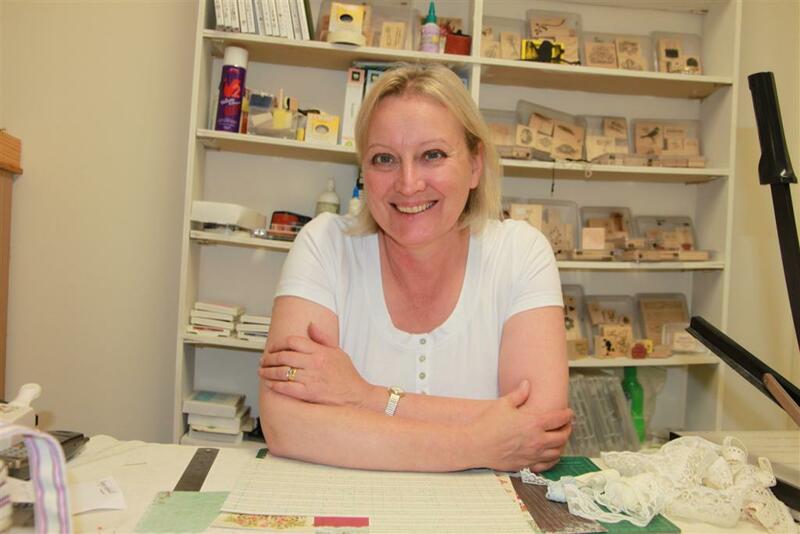 If you want to contact me e-mail me at helen@helenscarddesigns.com Since starting my blog last July I have realised one of my goals which is to have my own craft room,now I would like to set another, and that is to receive more comments, so please feel free to express yourself! what you like – don’t like , let me know and I will try to showcase more ideas that you all want to see. If you have your own blog leave details so that I can return the favour and visit you ! Absolutely beautiful cards! I love them. You are very talented. One of the things I like about your cards is the clean, simple designs. They are very classy! Thank you so much for your lovely comments! I love hearing from my visitors – it brightens my day.I am so glad I may have inspired you just a little.love Helen. Thank you for your lovely comments,we might catch up again at the shop one day! Thank you, Helen, for sharing your creations. I’m so glad I found your blog, as your style of crafting is beautiful and inspiring. I’m addicted to Kaisercraft paper! you are more than welcome! I love papers of any kind, but particularly Kaisercraft – love the fact they have new releases every month!